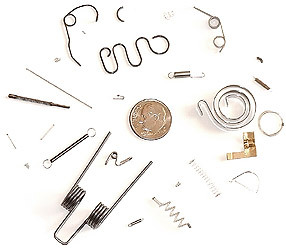 Since 1957 Dayon Manufacturing Inc. has produced quality custom miniature springs, sub-miniature compression, extension, as well as standard sizes with wire diameters of .0028 to .125 inches. Since our inception we have developed unique proprietary manufacturing methods that enable us to enjoy a reputation known the world over. Our new CNC wire form department uses state of the art Itaya wire forming and spring coilers to produce intricate wire forms for a variety of applications! Our honesty and willingness to help other spring manufacturers produce problem springs gives us a unique position in the spring industry. Since we make springs custom to our customers needs, we do not have a catalog, but if you have a drawing with specifications you can FAX it to us, or if you have a sample, send it to us and we can reverse engineer it then make a drawing for you and produce the spring! We can provide prototype springs along with spring design assistance. Dayon Manufacturing currently has over 18,000 square feet of production space.